There are literally thousands of RV campsites and parks across the U.S. and the RV crowd is on a constant move from coast to coast and from Canada to Mexico. The people they meet become family, so they are online enthusiasts. Our marketing project uses branded, well-written messaging to build an audience of social media and blog fans. 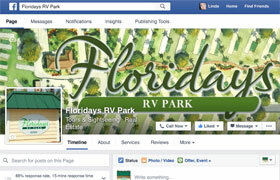 A primary goal is to promote backlinks on other RV-related blog and social sites, expand the park’s reach and reputation, be reviewed and rated on RV review sites, and foster a local community of Floridays fans.